-The inflatable item will not be set up unless the contract/ liability waiver is signed. ** Mileage rate ($ 0.75/km each way) applies to all out of town bookings. Rent water walking balls with inflatable pool in Calgary, Lethbridge and Southern Alberta for parties and events. Our water walking balls will draw a huge crowd at your event so rent them today. 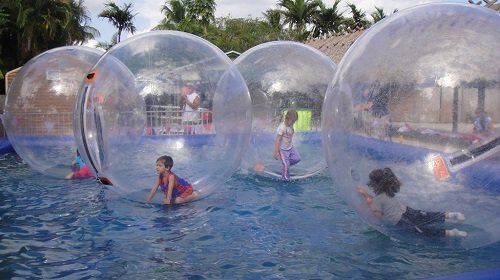 Our water walking balls come complete with a big inflatable 20' x 30' pool and 6 inflatable hamster balls. We can provide staff members to operate the water walking balls for an additional cost. Please read the FAQ section in the bottom of this page about this unique attraction as it contains information about filling and disposal of the water in the pool. This game is perfect for summer events. This is a real crowd pleaser and great for all age groups. This is the perfect game for teen parties, schools, city events and churches. This water walking ball pool rental comes complete with 6 water walking balls and inflatable pool. Customer to provide water (approx 5,460 gallons) to fill the pool and a water hose or we can give you a quote to have it filled with a water delivery service. The inflatable pool will take approx. 8 to 12 hours to fill with water depending on water pressure and other items. This water walking ball rental requires a very flat level area to set up and all the water will be dumped out at the end of the event. Q. Can I rent the water walking balls only and use my own pool? A. 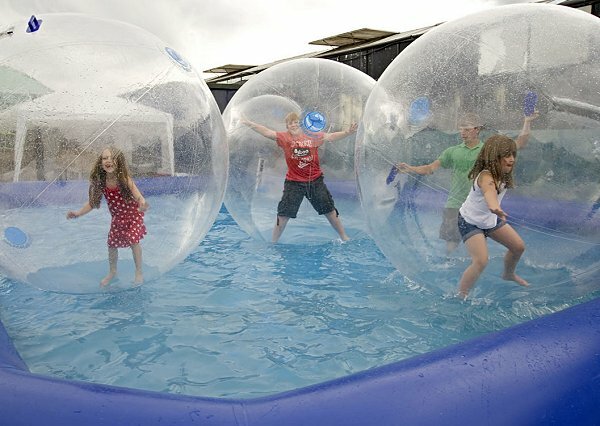 No, the water walking balls must be used in our inflatable pool and supervised by our employees. Q. Can I put the water walking ball pool in my backyard or fenced in area? How much room is needed to set up and operate? Yes, if you have AT LEAST a 3’ wide gate and clear path for us to access your yard. The area must be completly flat and level. The minimum required space to operate is 40’ wide, 40 feet long and 10 feet tall. Q. How long does the inflatable pool take to fill up and how much water does it hold? A. The inflatable pool will take approx 8 to 12 hours to fill up depending on your water pressure. The renter must supply a water hose and consistent water source to fill up the pool and monitor the water level during filling. We may need to deliver the pool the day or night before to start filling up depending on your start time. Our staff will not supervise the pool during filling. Our inflatable pool holds approx. 5,460 gallons of water at 1' deep. Q. Can I have water delivered if needed? Can it be filled faster than 8 to 12 hours? A. Yes, If you need water delivered for events in areas without running water or to save time we can refer you directly to a local water delivey company. They can fill our inflatable pool with water in about 15 to 20 minutes using a 3" fire hose and or a high pressure pump. You can arrange the details directly with the water delivey company. If you are a city or school you may be able to have the fire department come and fill it up but remimber you will need around 5,460 gallons of water. Q. What surfaces can the water walking balls with pool be set up on? Q. Is adult supervision recommended or required? If we need more staff can you provide it? A. Yes, adult supervision is REQUIRED the entire time the inflatable pool is in use or has water in it. Never leave a pool unsupervised for any reason. Yes, we can provide event staff to operate and supervise the water walking balls during your party times for an additional cost. You can easly use 4 to 5 people total for maximun output and you are welcome to provide your own helpers and our staff will assist them with what to do. Your provided staff or helpers must be at least 18 years old. We can also provide more staff at a rate of $20.00 per hour but the staff must be ordered in advance. Staff time starts 30 minuets to 1 hour prior to party start time and ends 15 - 30 minuets after party end time. Please call for details on staffing as many things are factored in staff pricing. Q. Where does the water go after the event is over? Do you take the water with you? A. Our inflatable pool will drain the water out onto the ground. There is no hose connection or any other way to remove or divert the water from just running out at the set up area. We must completely drain all of the water at the set up area before moving or transporting the inflatable pool. There is no option for removing our inflatable pool full of water. You may rent a high volume gas powered water pump with enough hoses to pump the water into a drain area but our staff will not assist with this process. We will be happy to give you advise on what to rent or we can handle this process for an adtional charge. This would require a site visit and some pre planning so please call us prior to ordering or at least 7 days prior to your event to set this up. Q. What is the maximum weight and minimum height requirements for water walking balls?